Sudanese troops shot at a "clearly marked" United Nations convoy in Darfur, apparently mistaking it for a group of rebels in the first attack against the peacekeeping mission since it began this month, U.N. officials said Tuesday. A Sudanese driver was critically wounded in the shooting late Monday, and the U.N. said it protested to the Sudanese government that "a clearly marked (U.N.) supplies convoy was attacked by elements of the Sudanese Armed Forces" in West Darfur. A fuel tanker truck was destroyed and an armored personnel carrier was damaged in the attack, the U.N. said in an earlier statement. The South African peacekeepers protecting the convoy did not return fire, and the U.N. suffered no casualties. "The secretary general condemns this attack in the strongest possible terms and stresses that ... the government of Sudan has to provide unequivocal guarantees that there will be no recurrence of such activities by its forces," the U.N. statement said. There was no immediate comment by the Sudanese government. A U.N. peacekeeper in Darfur earlier told AP that the Sudanese army apparently mistook the U.N. troops for Darfur rebels who also operate in this volatile area near the border with Chad. "It was nighttime, it seems the (Sudanese) soldiers lost their calm," the peacekeeper said. A senior official with the U.N. mission, known as UNAMID, said the Sudanese soldiers stopped shooting after 10 minutes and let the peacekeepers go. Both the peacekeeper and the official spoke on condition of anonymity because they were not authorized to discuss the attack with the media. United Nations vehicles are painted white and marked with the U.N. logo to signal their neutrality. It was unclear how the Sudanese army could have mistaken them for rebels, who usually drive camouflaged pickup trucks and have no armored vehicles. Head of mission Rodolphe Adada consulted with Sudan's Foreign Ministry Tuesday afternoon and both sides agreed to launch an investigation, UNAMID spokesman Noureddine Mezni told The Associated Press. "The is the first time UNAMID is attacked, and we hope it will be the last," Mezni said. "We are in Darfur to bring peace, not to fight." The U.N. mission is the latest international attempt to quell the violence in Darfur, where more than 200,000 people have died and 2.5 million have fled to refugee camps in nearly five years of fighting between the Sudanese government and local rebels. A previous African Union force of around 7,000 troops was unable the end the chaos and suffered dozens of casualties. The new joint force currently stands at about 9,000 troops and police and is supposed to grow to 26,000. But the deployment is far behind schedule and Western countries have so far failed to commit heavy fighting equipment such as helicopters. 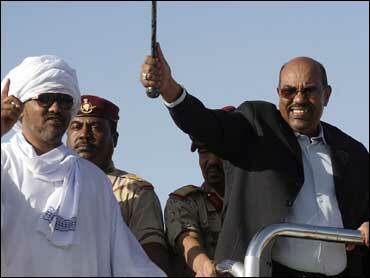 Sudanese President Omar al-Bashir had long opposed any U.N. peacekeeping force in Darfur. Under heavy international pressure, he relented in June, agreeing to the hybrid U.N.-AU force. But U.N. officials say his government has thrown up numerous bureaucratic obstacles to the deployment and has tried to limit its powers.